Where and When? Once every four years, a General Conference convenes. The 2016 G.C. 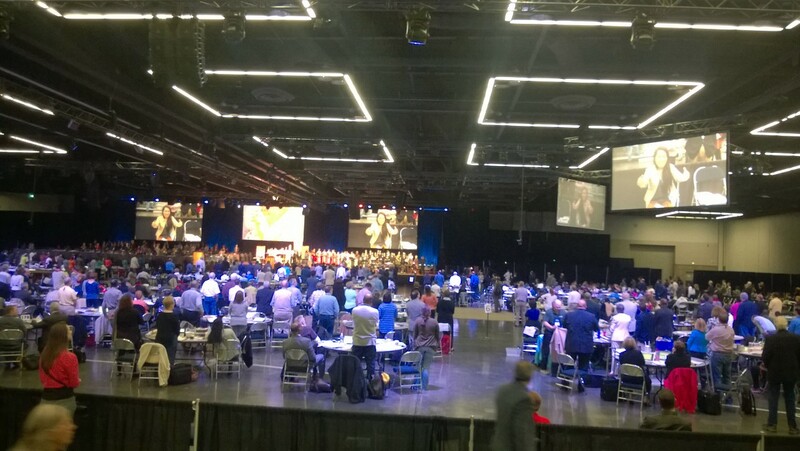 gathered in Oregon Convention Center, beginning on May 10. Four years ago the 2012 G.C. convened in Tampa, Florida. The 2016 G.C. ran through May 20. You can read the official version of the 2016 event by clicking here. What I'm providing is some impressions of how the 2016 G.C. appeared to me, a Portland resident, retired United Methodist ordained elder, and casual visitor. Visibility. The 2016 G.C. 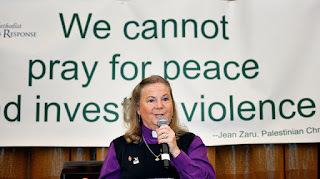 was visible globally (see New York Times article), but especially throughout the Portland area (estimated population, 2.3 million) thanks to United Methodist public relations sentences such as "Open Hearts, Open Minds" displayed on area transit vehicles. In addition, as I was leaving the Convention Center on a Metro transit bus I saw a giant (est. 80' high) billboard attached to a riverside grain elevator displaying U.M. outreach information. Thanks to the public relations experts in United Methodist Communications, the city knew we were here. Pentecost-like Diversity. At the kickoff event of early Christianity, known as Pentecost (read here), people from every land heard Christian preaching in their own languages. At Pentecost 2016 i Portland, during break times Asians, Africans, Europeans and Americans mingled in cafes and break-out rooms. 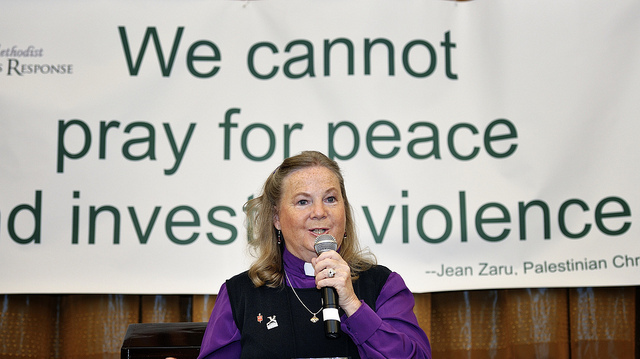 It's a global church, that old United Methodist Church. Purpose: I went to the G.C. to experience the diversity, meet West Africans, witness the worship, and see old friends. On Friday, I met and chatted with two wonderful Congolese and four gracious Liberians including Bishop Arthur Kulah (a dignified elder about my age) and Johnson Gwaikolo, president of The United Methodist University, Monrovia, and Dr. Mator Kpangbai, Vice President of the University. I am honored that these Africans admitted me, a total stranger to them, to their conversation circle. Stunning Facilities. One has to thank Metro, the regional government, for constructing a meeting facility with the space and technologies like the Oregon Convention Center. In the view below, check out the vastness of the hall. I took the photo from the third row of the bleachers. Notice the large projection screens. Whether during worship or business sessions, everyone got a close look at the expressive face of each speaker, watch the energy of the singers and drummers, and feel the authority of the chairperson. Stunning Staging. Even though it was a business meeting, every morning began with worship. The service I attended was like a giant Las Vegas entertainment show in scale, coordination, musicality and appeal. More Friends. I sat in the bleachers with old friends, Dr. Ron and Lois Hines, for the Friday morning worship, the first event of the day. Very special treat: I listened to and watched on screen the preaching of a former student, Bishop Elaine Stanovsky of Denver. Her sermon was just tremendous. For me, a unique lifetime event. Earlier in the week I engaged with my colleague from student days at Boston University, Dr. Don Messer, Executive Director of Center for Health and Hope (more on fellowship with Don in the previous post below). I met students and staff from Boston University School of Theology, in town for the G.C. Worship was like a religious mosh pit: motion, emotion, interaction with others around me, clapping, cheering, singing to the beat of drums. A mosh pit, yes, but with a holy purpose. Later, when I exited, I left with HOPE. 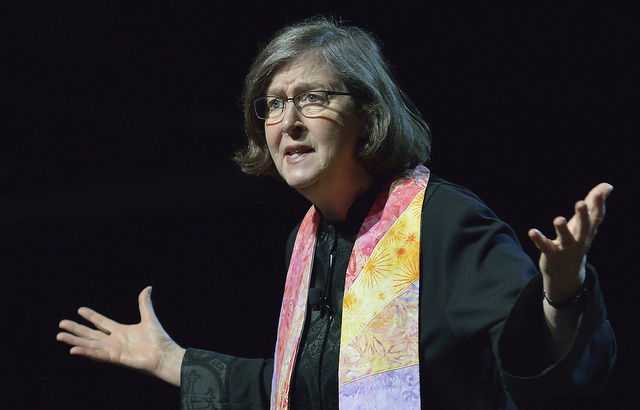 Thank you, Bishop Elaine Stanovsky, for preaching with such great theological finesse and conviction. Bishop Stanovsky preaching May 20, 2016. More Thankfulness. Though some very difficult decisions were put off upon the recommendation of bishops into the future, I was thrilled to visit a General Convention of my United Methodist Church. I never dreamt that I'd have such a chance.